FREE HUGS! YOU get a hug! And YOU get a hug!! And YOU get a hug!!! It's a dream come true. This sweet little panda bear wants you to know how awesome you are. Get ready for the world's coziest and most amazing bear hug ever. Mid-hug, colorful confetti will rain from the sky and shower you with love. 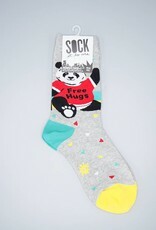 Seriously, could this sock BE any cuter? We can bear-ly stand it! 62% Cotton, 35% Polyester, 3% Spandex. Made in Korea.